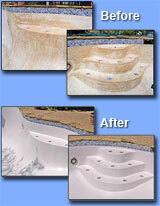 Call us before you decide to acid wash your pool. Our general rule of thumb for determining the need for an acid wash is, if you can see the floor of the pool then you can restore it with chemicals, brushing and filtering. If the floor is not visible, the cost of the chemicals and labor will generally be greater than acid washing. Also, extensive algae blooms can stain plastered pools, making an acid wash desirable. As an alternative, pools can also be bleach washed, pressure washed or treated with citric acid. Give us a call today for a free on-site consultation.